My mom thinks I’m a champion. She thinks I can do all things better than anyone else. Sometimes she’s so persistent that I actually start believing that I can be one – a champion. As I grew older and became a parent myself, I realized what she was doing. She was molding me into the kind of person that’s better than the best she has seen. She’s not perfect, far from it, but she’s seen enough on this earth to know what would be helpful to me in becoming a good soul. Who has shared the most hope with you? In honor of Mother’s Day, we’ve collected comments from I Share Hope guests who said their mothers gave them the most hope in life. 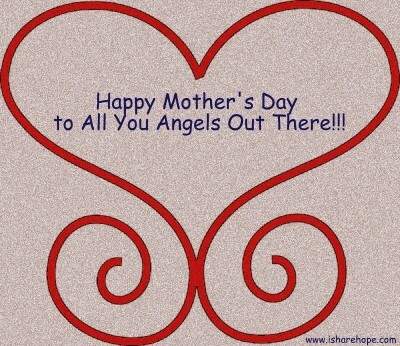 To our featured guests’ moms, you must be very proud! Read on and find out what they did that convinced their child that s/he is a real champion! Question: Who’s been the most hopeful or who has given you the most hope in life to date? Definitely my mom. My mom is an amazing person and a strong person. For me, everything I do is always because you want to make your parents proud, your family proud and you always want to make sure that everything that you’ve got, everything that they have to go through to raise me and to raise my brother and to put a roof over our head, to put food on the table, everything that they had to do, all the sacrifices that they had to make, I always want to make sure that when they look at me today, they feel that all of that was worth it. It was worth it. All the pain and the struggles and everything. My mom had a really tough life. I mean a really difficult childhood and so did my grandma there. Question: Who’s shared a lot of hope with you? Who’s been the best giver of hope in your life? My mom, she’s a fighter. She’s a warrior. She is a woman who is everything for me. She is my number one person in the world. I always tell a girl, when I meet a girl, I talk about her and say you’re number two because my number one is my mother. I remember, being young, we would see her go out her way to give us the best that we could have. My father died when I was young, so she raised me and my brother. She would do everything she could to keep us happy and healthy and fed and she never lost hope. Even when things are bad, she would look at me like, you see, that is not going the way it’s supposed to go. Just look at St. Peter’s eyes. Everything that happens to us, she has a positive thing on that. Even on the worst days, we have to try to look the best so we can get the best of everything I guess. Question: Who’s given you the most hope? Who’s been the person who’s delivered that kind of hope to you in your life? A person who’s been a huge impact for me would probably be my mom. She’s been a big influence in my world. I think the world of her and she’s an incredibly strong woman. I know whenever or like anytime life is beating me up or I am looking for that dose of encouragement or hope or wisdom, she is definitely someone that I go to frequently. Question: Who has shared the most hope with you? In your life, who’s back there that’s really given you hope? I think it’s probably my mom. I don’t really have specific memories or ideas that I think about my upbringing, but I think I’m the kind of guy who have – I dare to dream or I’m quite hopeful in a way. I think that must have something to do with my mom and the way that I was raised by her. Question: Who has shared the most hope with you? My mother is the person that always gave me hope. I did what she told me to do. I went down deeper inside myself than I’ve ever been and I found the strength to pull myself through. At that moment she said “Courage is a choice. Make it.” I learned that we can choose. Even in the moments that we don’t think we can do anything, I had to hope in that moment that she was right – that I could go further into myself than I had ever been and find the strength because I didn’t think there was any further place to go. I just allowed myself to hope that she knew what she was talking about and of course here I am today. These men and women of hope have so much admiration and gratitude towards their mothers raising and supporting them to become the person they are today – great people, strong people, kind people, hopeful people… I guess it’s that balance of vulnerability and strength that moms have that inspire their children. So when you mom tells you you’re a champion, believe her, because she’s right. Remember, it takes one to know one.